When first published in Russia, The Art of Soaring stayed at the top of Russian bestseller lists for a whole year. Revealing potent ancient techniques for manifesting your reality through humor, the book became an instant favorite with over one million readers. Changing your life on the spot has never been so much fun! The theory section is followed by hilarious real life stories of healed personal relationships, financial success, miracle cures, and more. Simple and irresistibly positive, it makes you feel lighter, and as you start applying these amazing techniques, get ready for miracles and laughter to enter your everyday life. It weaves together the practical wisdom of the world’s spiritual traditions, the authors’ insights, hidden messages encoded in ancient folk tales, and a potent dose of humor — enough to change your destiny and save the world. Make a wish. See it come true now! And this may well be the last self-help book you’ll need to read... because it actually works! Please enjoy and tell your neighbors: the outbursts of laughter about to shake your house are nothing to worry about. You’re simply reading The Art of Soaring. Buckle up! Prepare for takeoff! You are in for the ride of your life! 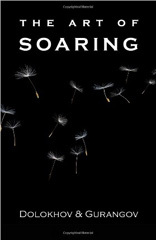 For those who ever sought real joy and enlightenment, The Art of Soaring delivers it all. You will literally feel lighter after reading this book! Plus it is so simple and so hilariously fun that you won’t be able to resist the temptation to immediately put to work the powerful techniques offered here. We can already see you walking through your life with a smile on your face, and wish you best of luck on your amazing journey! Why is it that many self-help books are not particularly helpful? May it be because they describe authors’ personal experience? Sure, it worked for them, but is it going to work for you? In the case of The Art of Soaring, the presented techniques have been tested by countless readers. We love the uplifting, outrageously funny real life stories included in this book. Actually, our own life is now filled with similarly miraculous experiences — on a daily basis!